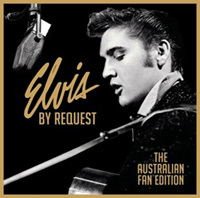 The Elvis By Request : The Australian Edition CD has debuted at No. 4 on the Australian ARIA Album Charts. This is the equal highest chart position of any release since ELV1S : 30 #1 Hits  10 years ago. Three albums, Elvis : 2nd To None , Elvis : The King  and The Romantic  reached No. 4 however not on debut. From The Heart peaked at No. 5 in 1992 and 'Presley : All Time Greatest Hits' No. 7 the previous year. Elvis Presley : 50 Australian Top Ten Hits 1956-1977 debuted at No. 9 in January 2010. The 'Elvis By Request' album contains the 40 favourite Elvis songs as voted for by his Australian fans. To debut at No. 4 is a most remarkable achievement particularly at this time of year. While the album has benefited from some very clever marketing from Sony Music [with more to come], all the promotion in the world won't sell a turkey, so clearly the concept has appealed as we expected it would. So with a great concept, title, cover art, fan picked track listing and the massive media coverage of the release on August 16 we have Elvis riding high on the charts once more. Great result and well done Aussie Fans. Sony Worldwide need to get their priorities right when it comes to marketing Elvis. Sony Australia have done a great job on this release. Fantastic result. Honestly I did not expect this. So I am stunned by the outcome. A big compliment to SONY and of course the strong fan base down under. Well done! They should have done the same in other large markets and allow the fans to pick any song they want to, instead of limiting the choice to a pre-defined list with the usual titles.